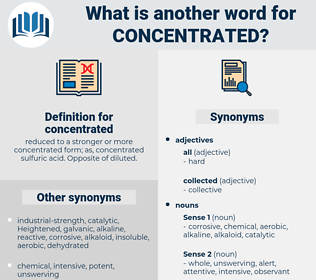 What is another word for concentrated? reduced to a stronger or more concentrated form; as, concentrated sulfuric acid. Opposite of diluted. 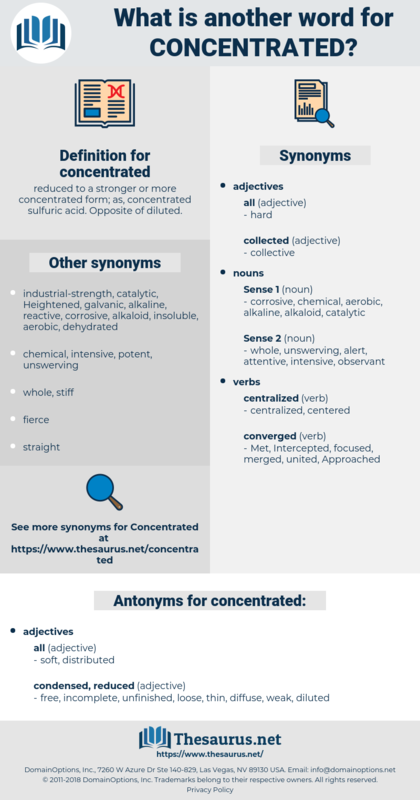 concentrates, Targeted, concerted, condensed, Converged, coordinated, sharpened, compact, localized, concerned, oriented, populated, targetted, intensified, target-oriented, concentration-dependent, enrichment, focal, labour-intensive, collaborative. consolidated, allocated, refocused, Rated, Contributed, related, considered, Consisted, reinforced, Corresponded, addressed, revolved, directed, Explored, covered, emphasised, Encompassed, accent, mainly, conducted, Came, emphasized, turned, reported, invested, Tackled, spent, stressed, primarily, Examined, Undertook, Aimed, expanded, pursued, involved, granted, increased, endeavoured, Insisted, Approached, Accounted, engaged, touched, essentially, Performed, highlighted, bore, Strived, Strove, reside, Assessed, Referred, cryopreserved, laid, Wore, assembled, mostly, transmitted, Carried, pointed, Tended, outlined, pressed, included, Earmarked, merged, paid, Discussed, geared, Appealed, spoke, underlined, Enshrined, moved, Urged, Filed, Resulted, Shifted, Brought, drew, Went, sought, massed, Caused, Dealt, Awarded, struck, Looked, live, Lived, raised, Pooled, Gave, Took, placed, Yielded, led, Talked, Surveyed, put, Pushed, attempted, centred, tried, Meant, based, especially, made, concerned, intensified. Congregated, consolidated, allocated, Collated, evaporated, refocused, accelerated, confined, orientated, Contributed, integrated, contained, dominated, fixated, Accentuated, exacerbated, amalgamated, Generated, Consisted, circulated, accumulated, constrained, reinforced, reunited, Relegated, designated, situated, addressed, Investigated, located, categorized, escalated, revolved, congested, preferred, collected, directed, Explored, covered, Convened, consumed, Transferred, gathered, Predicated, restricted, strengthened, Compiled, enhanced, represented, conducted, taught, emphasized, Anchored, turned, Comprised, characterized, narrowed, Cantoned, preoccupied, Delegated, reported, absorbed, utilized, augmented, organized, invested, arranged, spent, stressed, specialized, comprehensive, recorded, Favoured, collapsed, Undertaken, Deployed, Examined, Aimed, expanded, headquartered, pursued, entrusted, reflected, assigned, redoubled, involved, granted, increased, endeavoured, Captured, adapted, affected, coupled, pronounced, fastened, attached, Channelled, employed, Progressed, Accounted, Entered, rooted, expended, trend, Afforded, minded, conspicuous, engaged, touched, born, Borne, produced, Performed, highlighted, adjusted, Incurred, Stationed, Delivered, clustered, summarized, trapped, disaggregated, realized, Referred, keyed, cryopreserved, worn, Occurred, owned, Devolved, embodied, accomplished, realised, Achieved, laid, Been, assembled, intended, transmitted, Entailed, wrapped, Obtained, frozen, Carried, proved, proven, compounded, Monopolized, Tended, Handcuffed, positioned, pressed, established, applied, classified, included, leveraged, Earmarked, merged, Accorded, amassed, paid, Quartered, Mustered, precedence, Discussed, weighted, geared, credited, observed, Exercised, joined, effected, Enshrined, Allowed, structured, moved, aligned, subsumed, Filed, Resulted, Evolved, Herded, drawn, limited, destined, Shifted, Brought, Provided, locked, Challenged, sought, loved, Strapped, deprived, bound, charged, grouped, Caused, posted, washed, Dealt, Levelled, Awarded, Offered, struck, Tempted, tied, packed, liked, Looked, Lived, raised, guided, Housed, vested, Supplied, lifted, marked, set, given, Pooled, listed, divided, studied, Lumped, doubled, taken, clumped, wanted, damaged, placed, Yielded, door, risen, led, Wished, held, reserved, put, desired, doomed, designed, Pushed, built, driven, rounded, fallen, centred, secured, Bundled, formed, inclined, found, Lodged, seen, Shown, kept, founded, done, based, especially, made, Targeted, name, intense, sharpened, localized, concerned, oriented, populated, targetted, intensified. evaporated, pertain, Pertained, gathered, Worked, Targeted, concentration. free, incomplete, unfinished, loose, thin, diffuse, weak, diluted. watered-down, broken, light, halfway, delicate, encyclical, rationed, apportioned, fragmental, fragmentary, partial, deficient. Concentrated in the towns, without food or money to buy it, and many without clothing, these reconcentrados quickly became the victims of famine and disease.
" It was kind of you to invite me," he said and, very ill at ease, he took a seat between them and concentrated his attention on the house as it filled up.